Honolulu marathon - Welcome to a heaven on earth. Honolulu marathon is the whole pack. Of not only a great marathon to be running/training for but also has the unique Hawaii/running experience for all runners. If you look at the last years results, this race held in December yearly, the times aren't extremely fast (due to humidity mostly) but reports from runners entering are still very, very positive. So planning the Honolulu marathon at the end of your marathon training schedule can be very rewarding. If you are preparing for Honolulu marathon you may want to throw in some acclimatization days there in your marathon training schedule. And know how to deal with this (few tips on this below in the article ). Cause you'll have no problem dealing with the physiological motivation on the way..
As the scenery is too beautiful to avoid seeing. Thanks for entering the Honolulu Marathon article on Marathon Training Schedule. plus, of course - the whole Hawaii pack ! Enjoy, and for those of you who are planning to race Honolulu marathon : don't rub it in. Honolulu Marathon and its "young history"
Surprisingly for one of the youngest marathons, the Honolulu race is one of the largest in the world. Started in 1973, for the first five years it was run, it roughly doubled in size every year; that is almost unprecedented in marathon history! An interesting aspect of the race is that most of the growth in participation was due to people wanting to live longer, not a desire to compete. Back in the 70's, Dr. Jack Scaff, a cardiologist, was one of the first doctors to say that running was great therapy to fight heart disease. Then in 1977, an article appeared in Sports Illustrated that spoke of the race, and this was followed by the book "The Honolulu Marathon". All of these combined to make the race immensely popular and today people from all around the world take a vacation to Honolulu just for the run. Another interesting thing about the race is the large number of runners from Japan that compete annually. In fact, so popular is it among Japanese athletes that the Honolulu Marathon Association keeps a permanent office in Tokyo! Also, due to the race's popularity with the US military personnel who are stationed in Hawaii, the association has set up satellite marathon races in Iraq and Afghanistan to run concurrently with the race in Honolulu. These races have been held every year since 2004. Running in Hawaii presents some challenges, as the tropical weather conditions make for a rather warm (65 degrees to as high as 80 degrees), humid, and hilly course. More on the temperature a bit further below.. Yet, the run is considered very popular among first-time runners, and old timers as well. Next up, to the Honolulu marathon route. It starts across from Ala Moana Center, which is near Ala Moana Beach Park, and then gently winds its way west by the waterfront and into downtown Honolulu. From there, the runners travel east through Waikiki, then around Diamond Head, and then heads toward the eastern suburbs of the city. After that, they wind through Hawaii Kai, and then swings over to the finish line in Waikiki's Kapiolani Park. See the course map for more information on the route. For more info on the route and registration, pleasee visit the official Honolulu marathon site here. The weather during the Honolulu marathon. Summer in the winter.. Yes, expect it to be relatively hot and relatively humid. During the month of December the temperature generally hovers around 80 degrees, however it is one of the rainier months. Throughout the month of December Honolulu receives three to four inches of rainfall. When it does rain it is a relatively short showers, then the sun reappears. The rain doesn't cool the temperature so that you'd notice too much; in fact it can make it feel more humid. As a participant in the Honolulu marathon it is suggested that you protect yourself against the heat and humidity. All runners should take this into a huge consideration. There will be aid stations all along the course that will provide fluids and any necessary first aid. You should be sure to re hydrate yourself throughout the race to avoid the possibility of heat stroke. As the course on Honolulu is not the main challenge (though not the fastest one out there), what you want to take into special consideration in your training is the weather factor. learn to drink during you training runs. learn to drink during training runs. Thing is, if you are running under such conditions such as the Honolulu heat + humidity you need to drink and provide your body with enough energy during the race. Research shows that if you actually get your stomach used to drinking during training's, you can increase the absorption from your stomach of energy to a great extent. Prepare well - and prepare the drinking as well as the marathon training. Registration and the "more formal stuff"
Finally : online-registration up next. The Honolulu Marathon provides an Official entry form that can be downloaded in a PDF format and be sent back to The Honolulu Marathon, 3435 Waialae Ave., Suite 200, Hawaii 96816. On-line registration is expected to start in early June. Late registrations can be hand delivered to the Honolulu Convention Center between designated dates yet to be announced. The Honolulu Marathon will publish and post registration timelines along with the entry fees. When submitting your registration form, you need to be sure you include your entry fee or it won't be counted. Entry fees for residents and non-residents are different. Be sure to contact The Honolulu Marathon to find out what the fees are for the 2008 Honolulu Marathon. Keep track of yourself... and the results of the race ! Throughout the course clocks will positioned so that runners can keep track of their race times and properly pace themselves. Also, clocks will be on pace vehicles. Complete race results, along with finish times, will be made available online at honolulumarathon.org. In the 2007 race, the latest for which results are available, Ethiopia's Ambesse Tolossa (aged 30) won the main marathon race, as he had the previous year. It wasn't a quick race, with the Ethiopian finishing in 2 hrs 17 mins 26 secs - almost four minutes slower than the previous year. Alevtina Biktimirova, from Russia, won the women's race in 2hr 33 mins 6 secs. All race finishers will be permitted to complete the race regardless of their times. The 2007 Honolulu Marathon also gave finishers a finishers shirt and a medal, along with a handsome certificate. The Honolulu Marathon provides a tremendous amount information regarding the 2008 marathon, which includes how, when, and where to submit registration forms, registration fee information, hotel information, an FAQ section, and much more on their website. Wonderful Hawaii, what better place to pick for a marathon ? Now, if you truly want to run a marathon, what better spot could you pick than a vacation wonderland such as Hawaii? We're talking about a virtual Garden of Eden here, where the climate is beautiful all year long, and you can take your pick of miles and miles of glorious beaches. Do you love to surf ? Of course, the Hawaiian Islands are also rich in Polynesian culture and history. There are countless museums and historic sites, not to mention food and shopping to tempt you. Many restaurants provide hula dancing along with spirited Polynesian music. And, if you love volcanoes, you can see one of the few active ones in the United States. 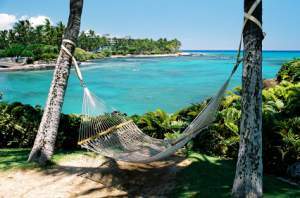 Hawaii is also a lush, green garden with many exotic plants to see and enjoy. If you or your family loves maritime history, consider going out to see the Arizona Memorial, and some of the other features of Honolulu Harbor. So, no matter what your interest might be, there are plenty of things to do in Honolulu. Good luck with the Honolulu marathon preparation and training! Boston Marathon - Boston Marathon - one of the "main marathons" out there. One which you need qualification to. More on that and other info. London marathon - Top one in the world together with the New York Marathon ?